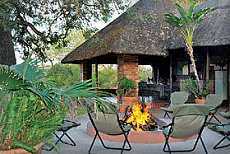 Djuma Galago Camp offers a personal safari experience for family or friends. 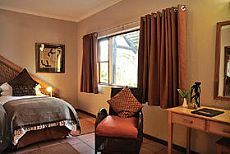 This self-catering lodge has five en-suite colonial style bedrooms, suitable for groups of up to 10 guests. Have the freedom to tailor-make your own African bush experience, without compromising on comfort, luxury and bush expertise. 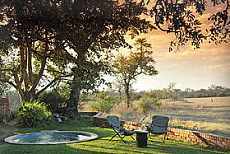 The camp is built on the banks of a wildlife-rich watering hole, where you can relax in the plunge pool in the expansive deck and watch the animals pass you by. It includes both indoor and outdoor cooking facilities. Guests bring their own drinks and cooking supplies for this self-catering lodge, although a chef can be arranged prior to arrival. The Galago experience includes a guide and tracker and a private game viewing vehicle, with additional quarters for guests' own staff such as pilots, guides or chefs. The exclusivity of Galago camp allows guests to relax and unwind to a flexible schedule. A chef is available at an addittional fee. 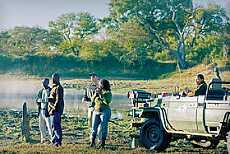 A tracker and qualified ranger will take you through the reserve in specially designed game-drive vehicles, and do their utmost to deliver the finest game viewing opportunities. After a hearty breakfast, a bushwalk with one of our experienced rangers offers the opportunity to take a closer look at your wild surrounds. Discover unexpected surprises like a chameleon perched on a tree branch, or view the thousands of birds that roam Djuma's skies.